Sep. 22, 2017 12:46 p.m.
Know someone who has made a significant contribution to the sports landscape in B.C. that deserves to be honoured? Then the BC Sports Hall of Fame wants to hear from you as they search for the 2018 induction class. The BC Sports Hall of Fame preserves and honours BC’s sport heritage by recognizing extraordinary achievements in sport. All nominees must have attained a high level of excellence and have brought honour to BC sport through their passion, commitment and dedication to sport. Last year’s induction class included Cloverdale’s Geroy Simon and Langley’s George and Dianne Tidball, who were inducted posthumously. 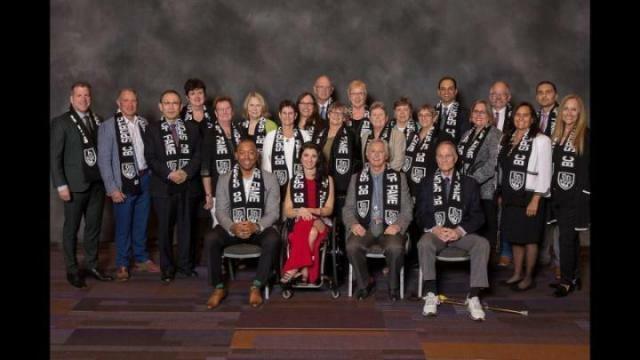 “The BC Sports Hall of Fame has the distinct honour of celebrating our province’s athletic history, and induction as an honoured member is one of this province’s highest sports honours,” said Allison Mailer, the executive director of the BC Sports Hall of Fame. Nominees are needed in the athlete, coach/builder, pioneer, media, team and the WAC Bennett Award categories are needed. The deadline for nominations is Oct. 1 and the 52nd induction class will be announced in December. The induction ceremony is set for May 31, 2018. Nomination forms, which include the full selection criteria, can be downloaded at www.bcsportshalloffame.com.